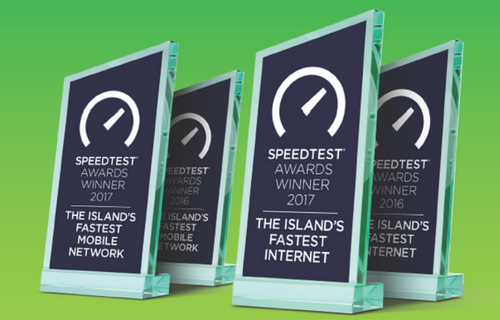 JT has once again been confirmed as the fastest mobile network in the Channel Islands and Internet Service Provider in Jersey by Ookla – the globally recognised leader in Internet performance testing and metrics for broadband and mobile networks. Results from all networks across the Islands were analysed by Ookla. This is the world’s most popular Internet performance testing service. Consumer-initiated test results using Speedtest by Ookla confirm that JT has faster Speed Scores. Faster than any of its competitors. The tests were carried out from April to September in 2017 using industry-approved methodology. Ookla’s results are widely trusted by regulators, trade groups and analysts. They are used by virtually every major mobile carrier and Internet Service Provider in the world. This includes being used by the GSMA. Each day, over eight million tests are carried out on Speedtest. Their customers include Microsoft, Cisco and Vodafone. Daragh McDermott, Director of Corporate Affairs at JT, said: “The Channel Islands are well served by mobile and broadband operators. These results from Ookla simply help people decide who to choose. JT is a full-service Tier-1 global consumer and also a business enterprise provider. They have over a 120-year’s heritage based in the Channel Islands. Therefore, JT offers a domestic and global customer base a range of world-class services. This includes; voice and data; consultancy; co-location; leading-edge data hosting; internet; security; cloud back-up; fixed and mobile technologies; e-Gaming; M2M; Cloud Services (IaaS); fully managed IT services; and wholesale solutions. Across 11 global locations, JT employs over 600 staff. Providing products and services to over 1.4 million global consumer subscribers and 2,177 active business customers. JT has an international presence across Europe, Asia and the United States. This has aided its evolution in becoming a leading supplier in roamed services.